I don’t have grid power on the new property. I do have solar panels tied to some deep cycle batteries, but I’m finding that they aren’t adequate for several reasons. The first is that I can’t run big power tools off of what I have. The second issue is portability. 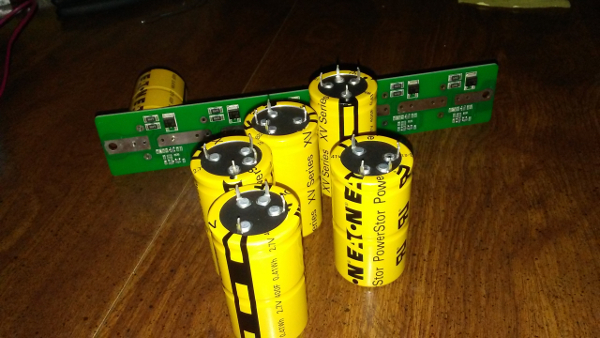 I’m going to address both of these issues with supercapacitors. The the stuff I’m trying isn’t my idea. I got my inspiration from a guy who goes by lasersaber on YouTube. 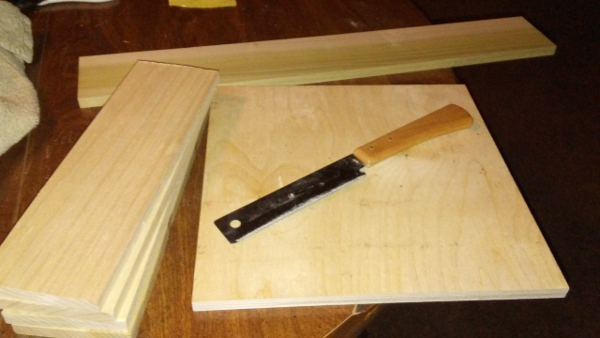 First, I’m going to make a box that I can throw in the back of a car. It’s going to give me the ability to charge little stuff and maybe even jump a small engine vehicle. I can charge it ahead of time or use a hand crank to charge it. Second, I’m going to make a box that can run equipment like a cement mixer (this is a big deal! ), table saw, etc. This can be charged ahead of time or by solar, etc. It will be too big to charge with a hand crank. 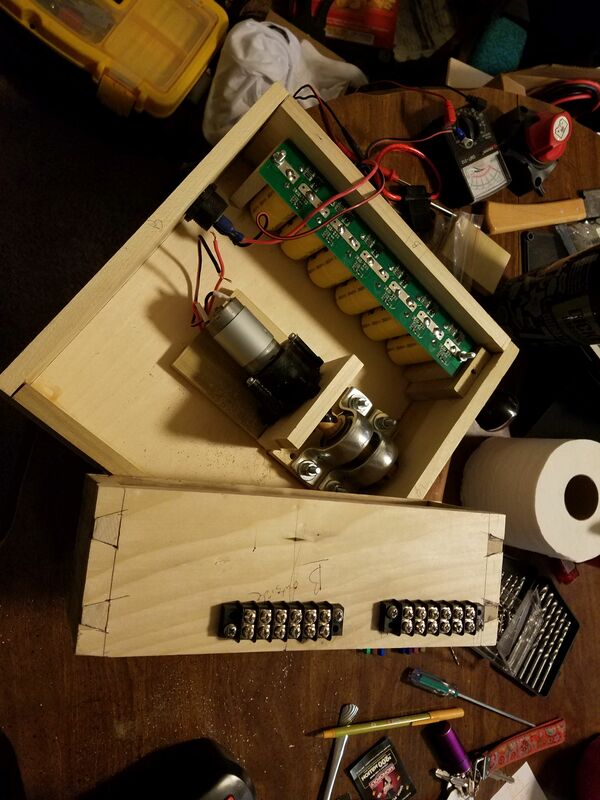 This post is detailing the first build: the crank box. 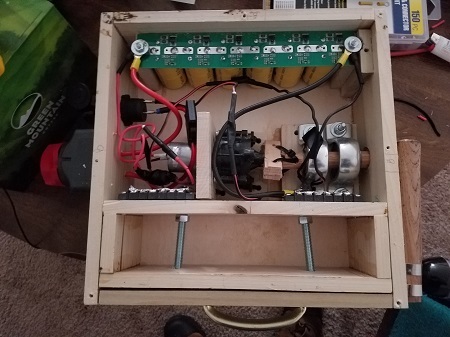 This is a learning experience and if I feel I need to, I will rebuild this box after I learn some lessons from the first build. I’m not going to hit every detail. Feel free to watch lasersaber’s videos and go to his site, laserhacker.com, to buy some of the parts. Caveat: Recognize that a hand crank is not very efficient. It’s either going to take an extreme amount of effort to turn the crank, or it’s going to take a lot of revolutions to charge the capacitors. It’s going to depend on the gear ratio of the gearbox you use. I bought a motor with a gearbox already attached. 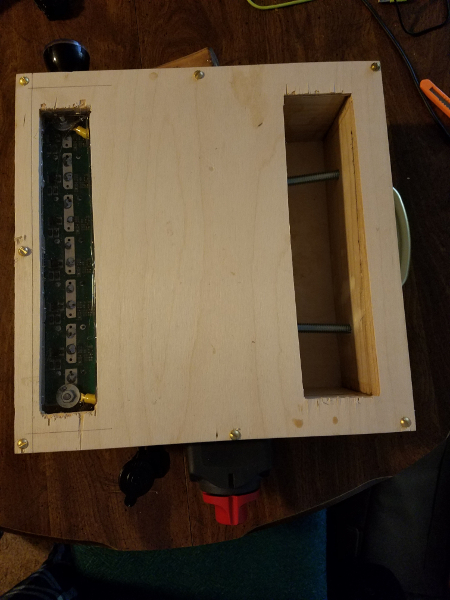 My goal was to build a box that would take less than 20 minutes of cranking to be fully charged. 20 minutes is a lot of cranking. By hand. Actually, 4 minutes is a lot of cranking. This box is not going to see a lot of use–it’s for more extreme situations. A battery tends to only use 20-30% of its juice. A battery gives up electricity slowly. A battery’s voltage does not drop very much until it is close to discharged state. A battery holds a lot of juice. A capacitor is different than a battery. It is quite happy to give up all of its juice. It is quite happy to give it all up RIGHT NOW. A capacitor’s voltage drops quickly. A capacitor doesn’t have a lot of juice. I’m going to use an incorrect description but it may help you understand. Imagine a gallon milk jug. Now imagine a mayonnaise jar next to the jug. Both are filled with marbles. The milk jug obviously has more marbles than the mayo jar. But you can only shake out 2 or 3 marbles at a time from the milk jug. The mayo jar will easily dump all of its marbles because it has a wide mouth. The above description is inadequate in many ways. For most jobs, a 12 volt car battery will keep a small incandescent light burning for hours. A supercapacitor bank will probably keep the same light bulb going for a few minutes. The benefits of capacitors are that they charge faster and they can take being charged many more times than batteries can handle. The capacitor bank I am going to use peaks at 16.2 volts. I will only be able to use part of the juice in the bank. The range will probably be from 16.2 volts down to 8 volts, depending on the application. My first purchase was a motor. 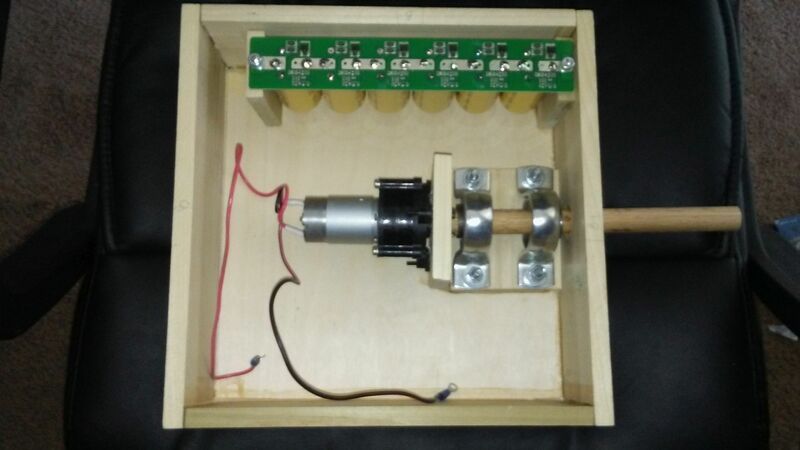 I wanted a dc motor that would produce 12 volts at one revolution per second. I thought that was a reasonable expectation of a hand crank. I found a motor on eBay. It was described as “Wind DC Generator Hand Dynamo Hydraulic Test 5v/6v/12v/24v 1500mA 20W Motor” and it was listed as new. It cost me $8.91 plus $3.90 in shipping. The price was too good. 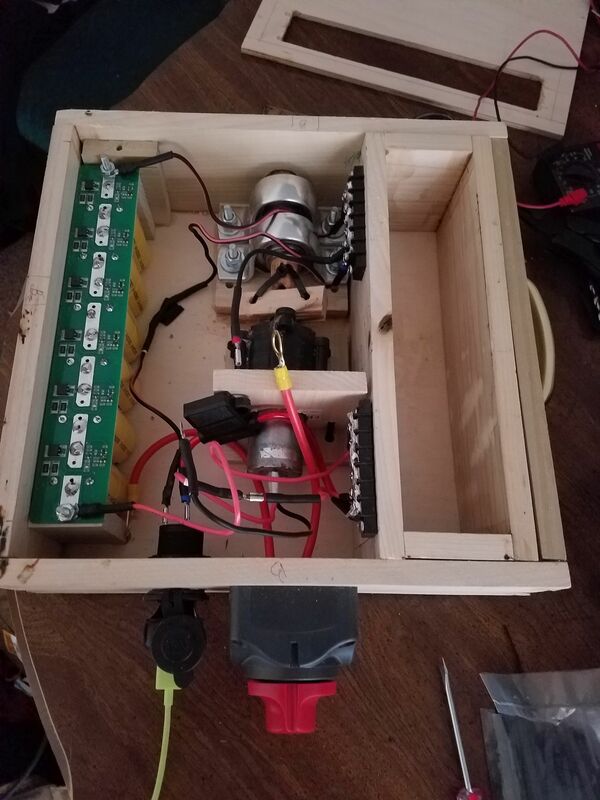 When the motor arrived, it was obviously used and still had solder and bits of wire connected to it. I figured it was worth trying even though it was used. 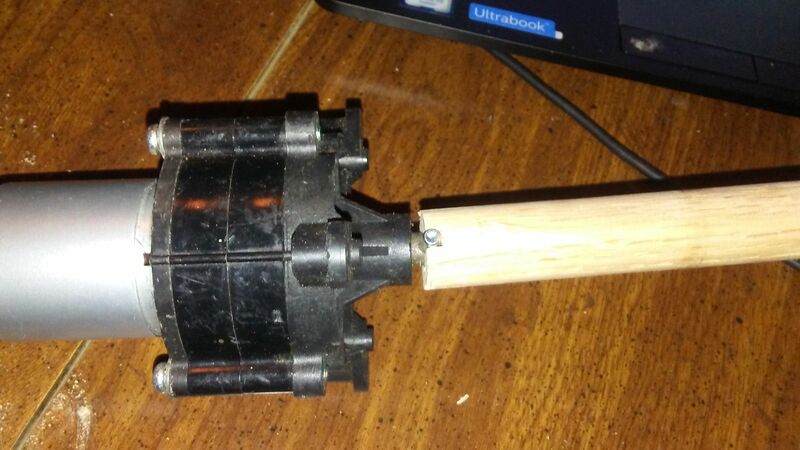 I cut a dowel to fit on the shaft of the motor. 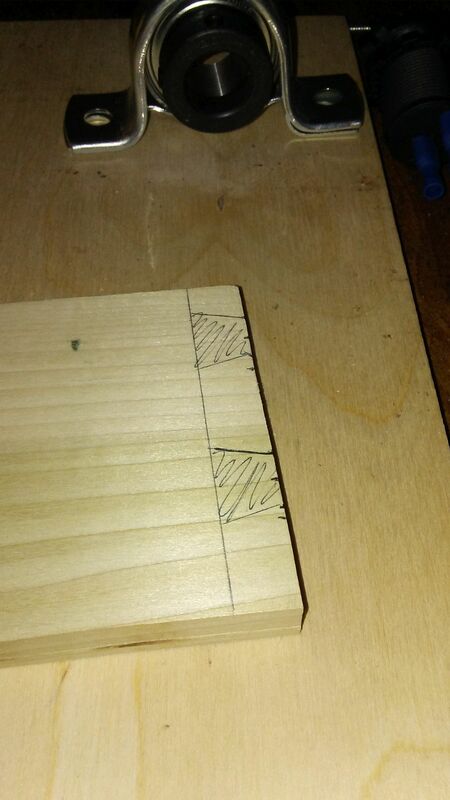 There’s a crossbar that goes through the shaft, so I had to cut a groove in the dowel. 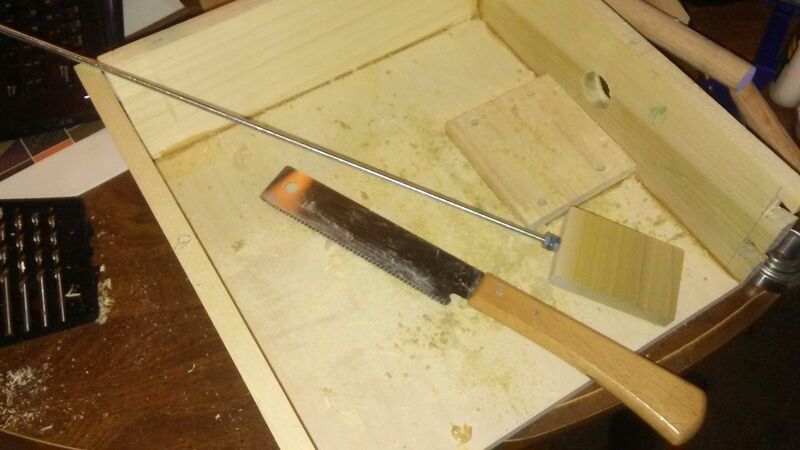 I attached a hammer handle to the dowel and added another piece of dowel to the other end to make a handle. Instant crank handle to test this motor. I hooked up the multimeter and started cranking. It was hard to tell but it looked like I was getting almost 15v with one revolution per second. I was in business. I had a motor. Now I needed the rest. I ordered the supercapacitors from Mouser. Here’s the link. I ordered six of them. Next, I ordered a balance board from lasersaber’s site. laserhacker.com He let me know he was traveling and it would be delayed. Below you can see the capacitors and the balance board. 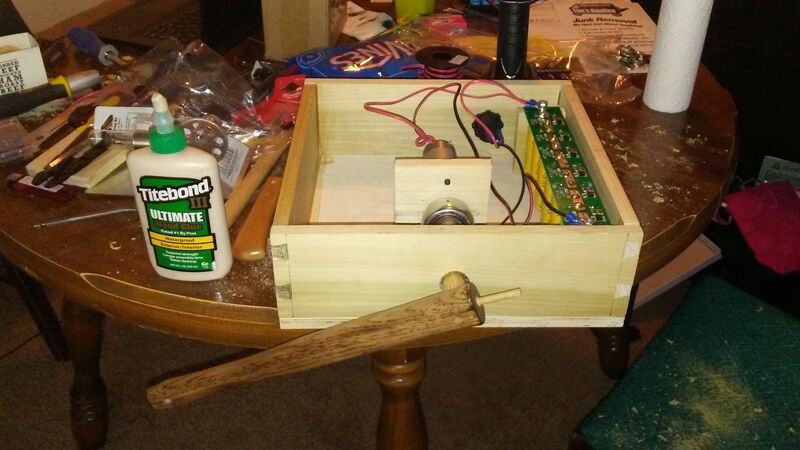 Next, I put together a box to hold everything and secure the crank. The box needed to be tough enough to survive life in a car trunk. 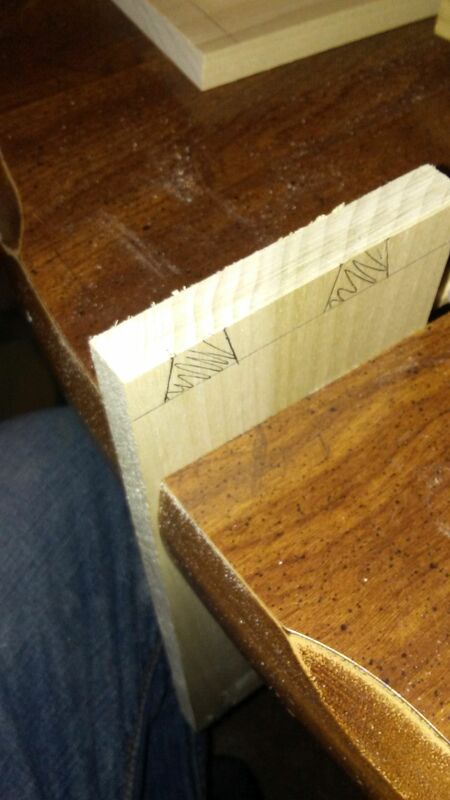 I decided to go with wood, using rough dovetails for the corners. fitting the pieces together as well as gluing a piece of wood for the bearings to rest on. Gluing the box walls to the base. Later, screws were added as well. Below, I’m checking the placement of the motor and the capacitor bank. I didn’t get it right the first time and adjusted it later. I cut a motor mount out of wood. Later I would add more wood as a base for the motor. I took two pieces of wood to use as mounts for the capacitor bank. I used all thread and cut it at the height I wanted. (I ended up adjusting the height later). 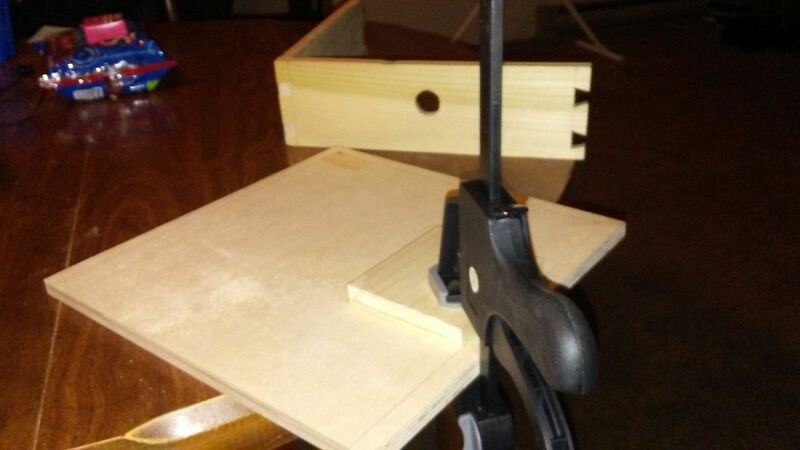 I used a hacksaw to cut the all thread, not the pull saw in the picture below. I have the capacitor bank mounted. Later, I glued the mounts to the box. Unfortunately, my wiring plan changed and I didn’t have enough all thread sticking up to do what I wanted. I ended up putting in shorter mounts. 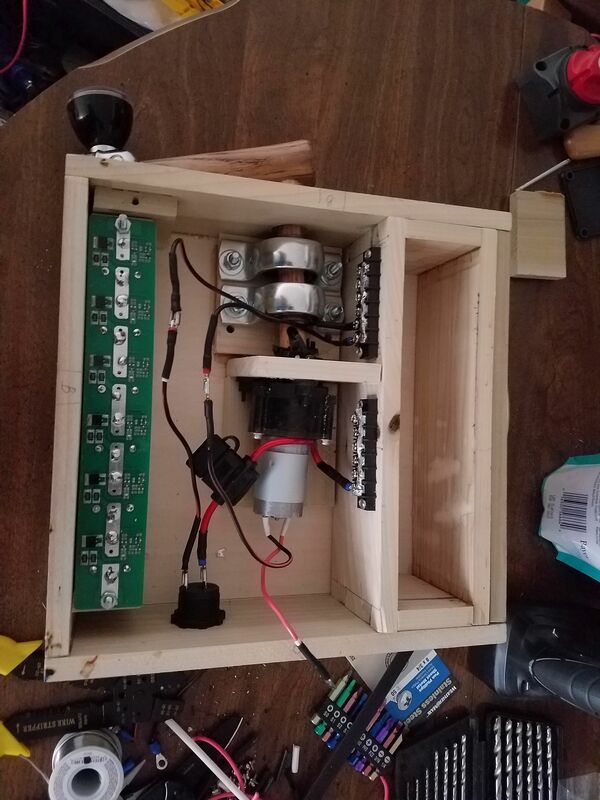 If I rebuild, I will make a box with higher walls as I don’t like the lack of space between the capacitors and the base of the box. The cigarette lighter’s purpose is for charging cell phones and other usb charged devices. I also need a way to connect a decent sized inverter, one that has clamps. I had to have posts for the inverter to clamp to, but I didn’t want to have the posts exposed. I built a second box to house the posts. I also added the barrier strips for use as buss bars. I soldered wire across each one later. It wasn’t easy to see in the last pic, but I’ve used a wire with a built in fuse for the cigarette lighter. I put in a 15 amp fuse. It’s the thicker red wire below. Also, you may have noticed that something funny is going on between the motor and the crank. It turns out that the shaft on the motor is bent and it wobbles. This is where not getting a new motor bit me. The pic below shows an attempt at a universal joint with zip ties. This configuration failed but I later fabbed a mount for the shaft (and more zip ties) that worked. Do you see the handle? 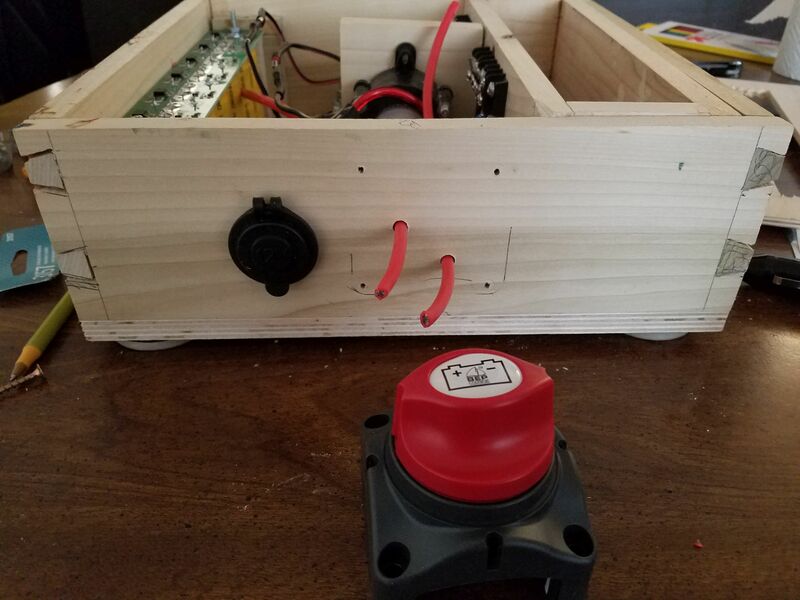 The hammer handle was cut down and a knob was added. The knob is normally put on tractor and truck steering wheels (vehicles without power steering). Even though I am going to have the posts out of the way, I want to be able to turn off the juice to them. I went with a battery disconnect switch. I’ve seen these used on drag race cars. I’m also using 10 gauge wire, both positive and negative. They will go straight to the capacitor bank, not through the buss bars. Here you can see the fix for the wobbly motor as well as the battery cut off switch install. 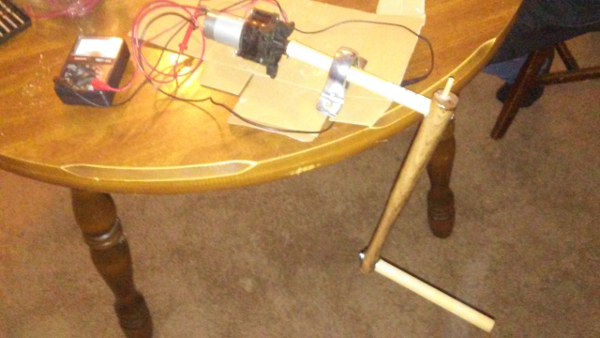 The fix was made from popsicle sticks, glue and zip-ties. In the background, you can see the lid for the box. I’ve cut a viewing window so that the capacitor bank can be seen when the box is closed. There are LEDs on the balance board that light up when the capacitors are charged. 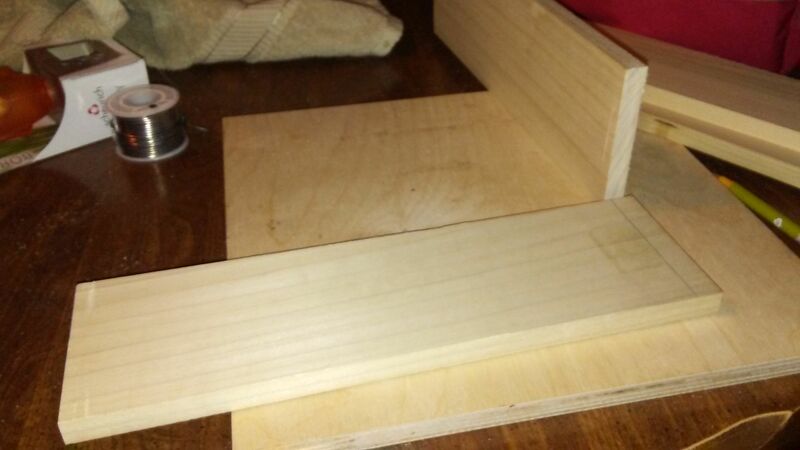 I also cut a hole in the lid for access to the posts (posts not installed in pic below). I stuck a carrying handle on the side of the box. You can see it on the right side of the pic above. You can see the two bolts I installed for postive and negative posts. I had a really good reason for angling them, but I don’t recall it now. The negative wire goes straight to the battery bank and the positive goes to the battery cutoff switch. Not too much left for this build at this point. I haven’t detailed my wiring plan. It’s not that important, but there’s one piece that I want to cover. I’m using the motor as a generator. 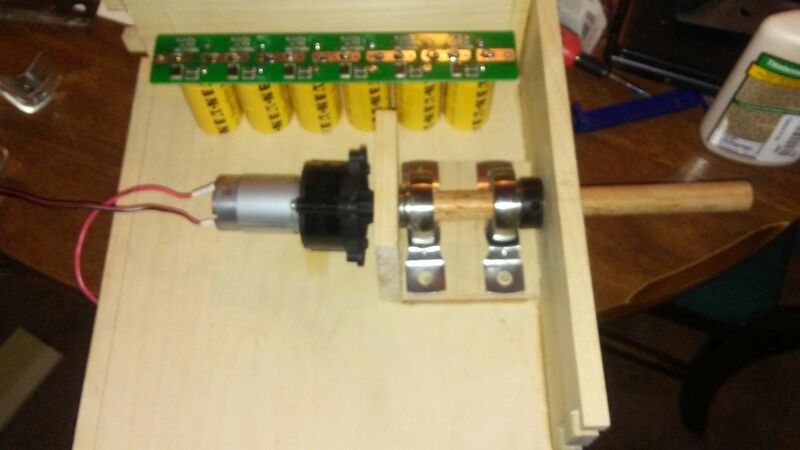 If you apply power to a dc motor, it turns. If you turn the shaft on a dc motor, it produces electricity. If I hook the motor directly to the capacitor bank, I can charge the capacitor bank. BUT there is a certain point when the capacitor bank has enough juice to turn the motor. My capacitor bank needs to charge to 16.2 volts. The motor will start turning at 4 volts. This means that I would have to spin the crank faster and faster to fully charge the capacitor bank. There’s a way around this, a kind of check valve for electricity that allows it to flow one way but not the other. It’s a diode. LEDs are diodes that happen to put off light. They can only take 2 or 3 volts before they die though. I need a much bigger diode, something that will block more than 16.2 volts. 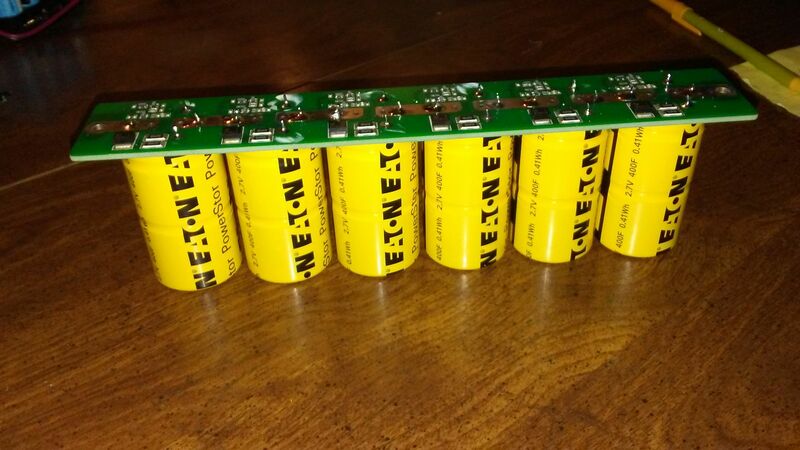 You can find these diodes for sale on websites that sell parts for wind turbines. The diode serves the same purpose–you wouldn’t want your battery bank spinning your windmill. I don’t recommend zener diodes. These are diodes that will allow electricity to flow the other way once a certain voltage is hit. So, there’s a diode between the hot wire of the motor and the capacitor bank. The eyelet connectors for the 10 gauge wire were too big. I soldered washers to them for a better fit. I’ve run some tests. The cigarette lighter works well. The caps give my phone about a 60% charge. The box stops charging the phone at 8 volts. I was able to get a 40% charge on my laptop using a 100w inverter with the cigarette lighter (didn’t try my bigger inverter). This is success–the box is useful but it doesn’t have as much oomph as I had hoped. I didn’t try to jump a car, though I’m sure there isn’t enough juice. The generator part of this box is a huge pain. It would make more sense to charge via solar or something else. I’d be tempted to leave the generator out of the box and connect it externally if needed. More juice. I’d like to take this box to the next level. Maybe 3 balance boards. There’s no way it could jump a small car. I don’t know why I had hopes that it would. I’ll probably pull the generator out of the box and add more balance boards. I can charge externally. I may hook the box up to vehicle power and let it stay charged all the time. I’d use another diode to keep the energy from flowing back to the car. This was a good learning experience. I think I’m ready to also build a 12 board box for running power tools. (See SOLN1 2000). Many thanks to LaserSaber for his engineering and his videos!